NEWTOWN, Pa. (WPVI) -- Some pundits say that Pennsylvania is now safely in the Clinton-Kaine column, but that campaign is certainly not acting that way. 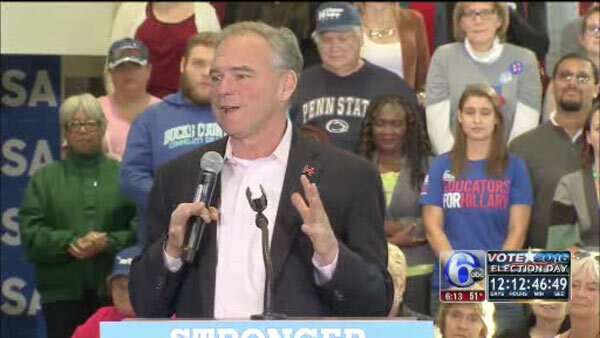 Vice Presidential candidate Tim Kaine was in Bucks County and then Allentown Wednesday. Kaine rallied a group of mostly students at Muhlenberg College. He talked about some of the issues that matter to this age group- equal pay, tuition-free education, and student debt help. Earlier, Kaine campaigned at Bucks County Community College as the Clinton-Kaine ticket works to get young people excited and out to the polls. There, he was introduced by a 9th grader wearing a "future president" shirt. Kaine told the students they need to think as well about the race for US Senate in Pennsylvania. He urged the crowd to get out and vote for Katie McGinty and criticized Pat Toomey for not saying he would vote for Donald Trump.